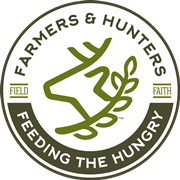 FHFH - Take Action - Farmers and Hunters Feeding the Hungry - Hunt Down Hunger! Donate deer, elk and livestock free of charge to any of the inspected, approved meat processors that participate with the FHFH program. For a list of FHFH participating meat processors, click here. Our volunteer chapter coordinators are motivated by an authentic desire to help others, and are committed to being an active part of the solution to hunger. For a list of FHFH chapters and coordinators, click here. Volunteers organize and coordinate the FHFH ministry in local communities nationwide by assisting with fundraising projects, promotional campaigns, meat processor recruitment, and more. FHFH makes a positive impact in the lives of those in need. Becoming a part of the FHFH ministry will impact your life as well! To learn more about becoming an FHFH chapter coordinator, click here. Local butcher shops and feeding programs are welcome to participate with FHFH. A request to participate can be made directly to the local FHFH chapter coordinator or to the national office of FHFH. If no FHFH chapter is established nearby, feel free to contact the national office to see how we my help. Corporations, organizations and foundations provide a significant amount of financial support, merchandise donations, and promotional assistance to our mission. Some provide support nationally while others give to help feed the hungry of a particular state or local community. Click here to review our listing of national, state and local sponsors and friends. To find out how to become a partnering sponsor please email our national office or call us at 866-438-3434!